Redruth head coach Steve Larkins says his side 'only turned up for the final 10 minutes' as they suffered their first defeat of the season. The Reds went down 27-25 at home to Cambridge despite scoring two tries in the final few minutes. "We turned up for probably about 10 minutes, and that was the last 10 minutes," Larkins told BBC Cornwall. "It was unfortunate that we couldn't string anything more together before that because we nearly beat them." 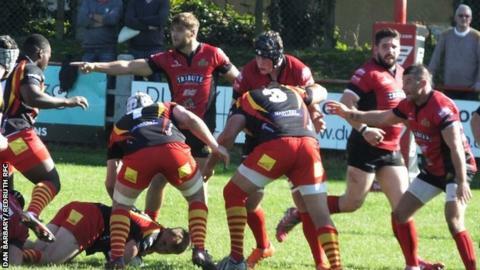 The result leaves Redruth fifth in National Two South after four matches. "We've been positive from the start of pre-season and we want to stay positive throughout this season," added Larkins, who has been at the helm since March 2014. "One iffy performance for an hour doesn't make us a bad team, I'm sure we can come back strong in the next couple of weeks. "It's pleasing to play poorly and nearly beat a really good team, hopefully we won't play that badly again."